And then came the kicker, a painful contortion of words—possibly the weakest excuse they could have drummed up—to justify years of unethical, anti-constituent acts by the man they supported. “Senator Thayer was at least consistent. During his entire political life, he has been a close ally of the power groups, a fact that he has never denied. Head of a power company, he was elected to the Assembly and then the Senate, and could not have been expected to change his views.” In any day and age, no matter what your politics are, that’s a sign of having drunk the Kool-Aid. 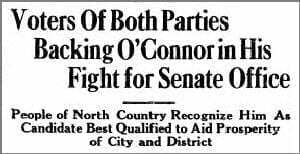 In November 1934, her Democratic opponent, John O’Connor of Ogdensburg, advertised heavily in local newspapers, emphasizing in large print that “Mrs. Graves Voted for the Jefferson County Bridge” rather than for one in St. Lawrence County. Headline stories predicted that the Democrats’ sweep to power nationally would be reflected locally, but in the state Senate race, it only proved true in the city of Ogdensburg, where O’Connor topped her by almost three to one. District-wide, she collected 56 percent of the vote, making Rhoda Graves the first female state senator in New York’s history. In her new position, she hit the ground running, proposing a bill within days of taking office, as photographs of Rhoda at her desk were featured in newspapers across New York and elsewhere. In late February, at a statewide meeting of Republican women, she and newly elected Assemblywoman Jane Todd were placed in charge of the Legislative Advisory Committee. Besides women’s issues, she supported the same causes that defined her entire career: milk pricing, farming, hydropower, and maintaining the family unit. 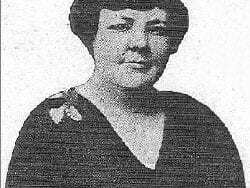 Up for reelection in late 1936, she faced Democratic opponent Edward Lynch of Ogdensburg, who received a headline in the Ogdensburg Journal for carrying the city by 428 votes—but overall, Rhoda defeated him by more than 7,000 votes and a nearly two-to-one margin. In 1937, she voiced strong opposition to a recent milk agreement, which she said was a dealer bill and entirely detrimental to farmers. Late in the year, she visited Watertown on the thirteenth day of a 19-county strike by the Dairy Farmers Union in protest against the law. 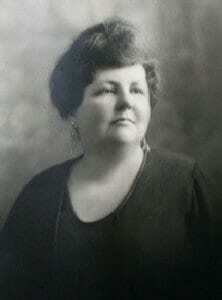 Graves, who had opposed the legislation, said, “What chance for a square deal is there when big-milk interests have and can build up a powerful block in the legislature to do their bidding?… I warned that price fixing would be slipped from the hands of the state to hands of the dealers by this law, and it was.” She was greeted warmly and cheered loudly by the farmers, who numbered more than 3,000. When milk-distributor representatives attempted to rebut her claims, they were booed and shouted down. For many party bigwigs beholden to corporate interests in one way or another, it was the last straw (farm pun intended). The time had arrived to cleanse themselves of the far-too-independent Mrs. Graves, which was music to the ears of her detractors up north. 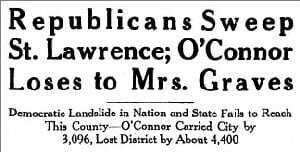 She had been grudgingly accepted by St. Lawrence County party leaders (forced down their throats was more like it) after winning four years earlier—and “grudgingly” was a fitting term, for there remained a grudge to be settled. 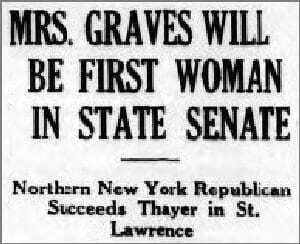 Bitterness against Graves boiled over when she sought a third term in fall 1938. Her own party rebelled by seeking a candidate to take her down in the primary, and in the process banish her once and for all to the political hinterlands. In July, Franklin County GOP leaders took action against Rhoda, seeking a return to the gentlemen’s agreement of years earlier. Party officials asked St. Lawrence County to support Assemblyman John Black of Tupper Lake, who was opposing her for the nomination. In return, Franklin County pledged their full support behind Allen Newell, St. Lawrence County’s candidate for the Assembly. In the face of it all, Rhoda did what Rhoda usually did: defied convention and won by a huge margin, capturing nearly 73 percent of the vote, the highest yet of her 11 political campaigns. The county chair, Ingram, unable to defeat Graves, announced his resignation in favor of a replacement from Rhoda’s ranks. Her resounding victory was described in stark terms by the Ogdensburg Advance-News. Flush with victory thanks to a mutual loyalty between Rhoda and her followers, she returned to business as usual in Albany, albeit with more influence and respect after bringing such powerful opponents to their knees. After toiling on behalf of farmers, deaf persons, milk producers, and cheesemakers, she won reelection again in November 1940, topping the Democratic challenger by a two-to-one count. 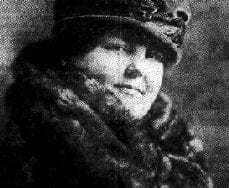 A month later, she was featured in The Woman Republican magazine as one of three “Victorious Republican Women,” as the article was titled. Attacks on her character and political abilities continued to surface from vanquished Republicans back in her home district, especially when she didn’t adhere to official party policy—which was the case whenever she felt doing so would harm her constituents. As the sniping continued and challengers to her position were sought, she just kept winning, doing so in 1942, 1944, and 1946. She was reportedly preparing early in 1948 for the fall election, but failing health in recent years convinced her it was time to retire at the age of 71. She had held an Assembly position for eight years and a Senate seat for fourteen, including ten as chairman of the Senate Agricultural Committee, a very impressive record. But after all the hard-fought battles that dismantled one of the most powerful political machines in the state, she wasn’t about to just give it all up. 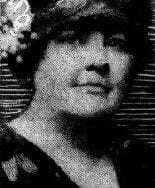 When longtime party opponents gleefully trotted out Potsdam businessman Harry Bullard as the next future senator from the district, Rhoda, always full of surprises when it came to politics, revealed another one while officially announcing her retirement: Paul Graves, her son, would seek the nomination to succeed his mother. And wouldn’t you know it … he won, and served until 1953, when he was elected to the New York State Supreme Court for a 14-year term. Less than two years after retiring from politics, Rhoda was vacationing in Florida when she became seriously ill with a heart condition. She died several days later at the age of 72, with her husband and two sons at her bedside. Honors and plaudits poured in from countless admirers and colleagues on both sides of the aisle, and from many women’s groups. Resolutions noting her death were prepared in both houses of the legislature, and the Senate adjourned early in her memory. Large contingents from both houses, led by the lieutenant governor, traveled north for the funeral in Gouverneur, where flags were flown at half staff for several days. Much more was done and said, but suffice it to say that, as a legend in state politics, she was treated as such. Rhoda Fox Graves was a political pioneer who, in the face of extreme difficulties, fought on, becoming a trailblazer in the truest sense. Women who have since attained New York State elective office owe her a debt of gratitude for being the first in many ways—one who bravely blazed a path for others to follow.